How do we set up an integration between Education Perfect and Schoolbox? Adding support for Schoolbox is a straightforward process, which normally requires a couple of hours of work by your school's IT team/LMS manager. Education Perfect's integration may differ from other integrations your school has, because we need a way to match a Schoolbox user to their EP account. This enables us to include the work they do in Schoolbox in their learning record when teachers are writing reports and running parent/teacher interviews. As a Schoolbox Administrator, select 'Administration' from the drop-down menu located beneath your name from within Schoolbox. Select LTI Providers out of the available options. Click the '+' button to open the 'Add Provider' dialogue box. 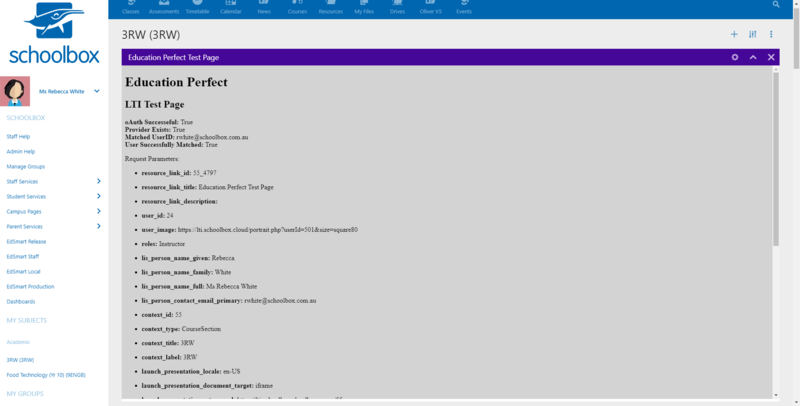 Input the test page URL (https://sso.educationperfect.com/Content/lti.testpage.educationperfect.com.xml) to the 'Configuration XML URL' field. Remember to include the Consumer Key and Shared Secret we give you. Now that the test page is available in Schoolbox, add a component in one of your classes, then select Multimedia and Embed Learning Tool. From there, select Education Perfect TEST page from the available options. If your students have already been using Education Perfect without a Schoolbox integration, their EP accounts will need to be linked to the unique identifier Schoolbox uses to confirm their identity. This enables any work that students do on Education Perfect in Schoolbox to be stored against their account. Often this is the user's school email address, but it can differ from school to school - the information in the test page above helps us to work out exactly what to use. Once all students and staff have been successfully set up with their identifiers, you can install the live integration in the same way as you added the test integration. The setup URL is https://sso.educationperfect.com/Content/lti.educationperfect.com.xml. Once this is done, your staff will be able to embed content into Schoolbox modules and classes for your students to complete.